In most NOOK Tablet eBooks you can search for a particular word or phrase. However, if you’re using a public domain file that is just a picture of pages (rather than the actual text), searching is impossible. 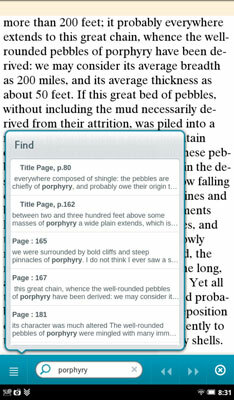 In the Reading Tools menu, tap the Find button. Tap a previous query or type a new search. You can broaden or narrow your searches. You can individually select most of the places to look for a file. And you can also clear your history of recent searches (another way to protect your privacy on some level). When you use it from the quick nav bar, the Search tool always looks in your NOOK Tablet Library; if you’re connected by WiFi to the Barnes and Noble Online Bookstore, it also looks for titles in the online shop. You can include or exclude other areas. On the Settings screen, tap Search (in the App Settings section). The Search Settings screen is displayed. A check box shows up by all the areas you can search; the Library and Shop are grayed out because you can’t remove them from searches.